So many people are using the Internet and their computers for searching, emailing, instant messaging, online shopping, and banking. In particular the home PC has become the educational, communication, and entertainment centre for families everywhere. Many store their digital information and personal files, photos, movies, music, CVs, financial information, and other valuable documents — on their computers! Unfortunately, a family’s PC may be compromised and provide hackers with valuable information that could include addresses, phone numbers, bank usernames/passwords, and credit card numbers. Identity thieves/hackers target home computers because they know families often do not maintain adequate security protection on their PCs and many families are simply not sufficiently internet-savvy. 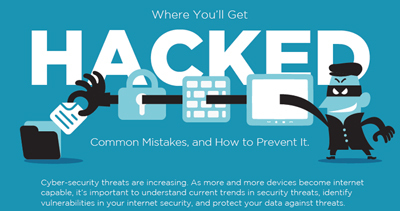 Many hackers access your personal information in order to steal your money and your identity. Others might want to use your home computer as a shield to mask their identity as they steal from others. Anyone can fall victim to hacking. Maybe the following is of use to you! Thanks to www.hotspotshield.com for this graphic.